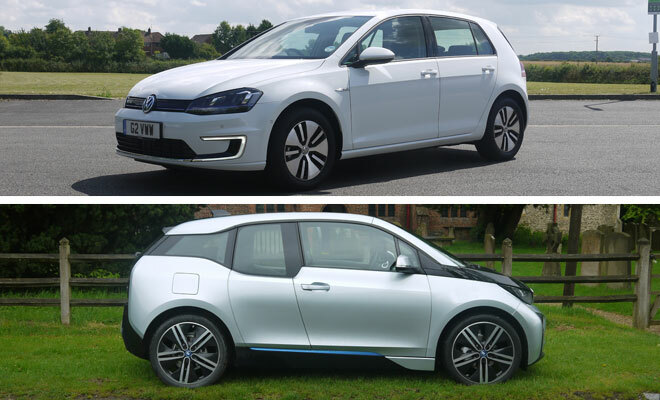 Volkswagen’s e-Golf and BMW’s i3 are both mid-sized electric vehicles, each produced by a well-regarded German manufacturer boasting strong consumer appeal. The similarities stop around about there, however. So exactly which of these two very different EVs is the better bet? BMW’s i3 can be had with a range-extending engine, while the e-Golf will soon gain a plug-in hybrid brother called the Golf GTE. For the moment, we are confining our judgement to the two battery powered cars alone. 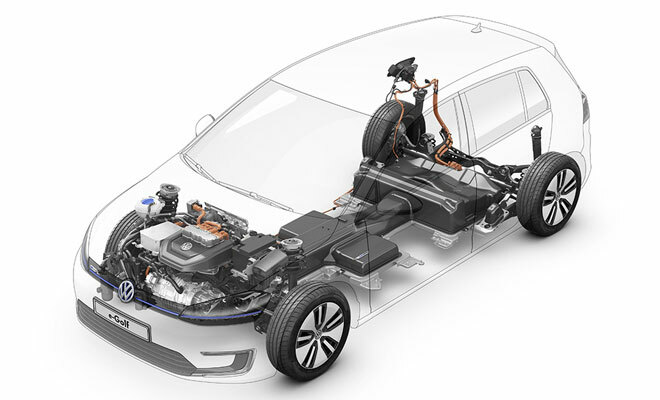 To create the e-Golf, VW has installed a battery and motor in an otherwise conventional steel-bodied five-door hatchback. The sharply styled seventh generation Golf was designed with electric propulsion in mind – VW made prototype electric Golfs using the previous generation bodyshell – meaning the new EV has arrived as a well resolved product. Full LED headlights (a first for VW), unique daylight lamps and flush-faced alloys mark out the e-Golf, but to most bystanders the e-Golf will be virtually invisible. Just another Golf among millions. This is either a good thing or a bad thing, depending on your extrovert tendencies. The outlandish i3, by contrast, is unlikely to slip by unnoticed. With its two-tone paintwork, boxy proportions and huge but skinny wheels, there’s no mistaking it for any other car. The i3 was designed from the ground up to be an electric vehicle, so drive one and you’ll trumpet your choice to the world. You’ll also have picked one of the most technically advanced designs on the road. Exterior panels are plastic, bolted to a light but strong carbon-fibre structure, sitting atop an aluminium chassis. 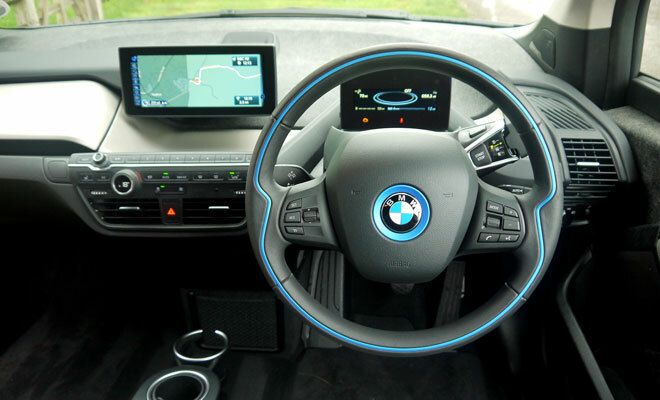 The cabin of the i3 faithfully mirrors the exterior, feeling largely unlike any other car. Some elements are familiar – such as the high-contrast central screen and its touch-sensitive, twist-and-prod controller by your elbow, shared with other BMWs – but the interior as a whole is unusually light and airy. The thick layer of batteries under your feet mean you sit quite high, almost on a level with small 4x4s. The rear passenger doors are hinged at the back, opening only after the front doors have swung aside, providing pillar-free access to the cabin. However, not being able to open the rear doors independently can quickly begin to grate. But it’s the i3’s tiddly boot that’s most likely to frustrate, offering only 260 litres (not much more than you’d find in a Mini) with no option to carry a spare wheel. Luggage capacity in the e-Golf is a more versatile 343 litres, though with a raised floor it loses 40 litres compared to other varieties of Golf and likewise can’t carry a spare. The five doors of the e-Golf are as conventional as the cabin, which feels solid and well put together. There is plenty of room front and rear, and it’s easy to get comfortable behind the wheel. 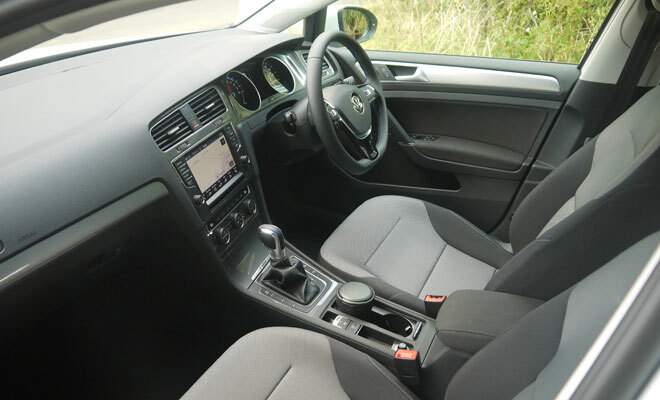 The electric Golf comes with a seven-inch central touchscreen, up from the 5.8-inch unit fitted as standard to other Golfs. The screen uncannily responds to an approaching hand, bringing up options and buttons before your fingertip can reach the glass. 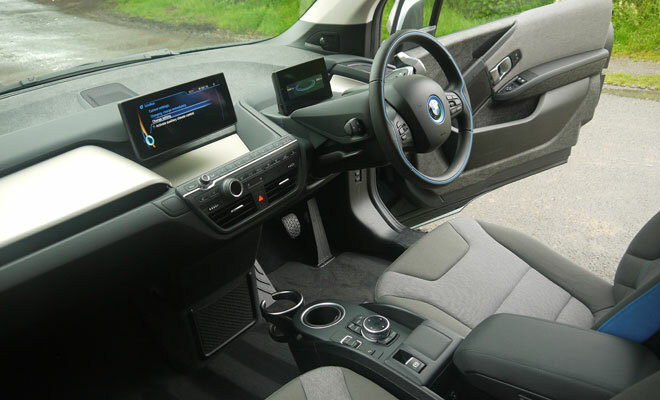 BMW has clearly put considerable effort into sourcing sustainable materials for the i3, including recycled polyester fabrics, leather tanned using natural processes rather than chemicals, responsibly grown eucalyptus wood for the dashboard, plus recycled surfaces in plain view rather than hidden away in wheel-arch liners. Similar special efforts appear to be absent from the e-Golf’s development, with an interior and bodywork that carries over from the rest of the line. At 1,510kg in weight, the e-Golf is also a hefty beast next to the i3’s 1,270kg. The difference isn’t solely down to BMW’s decision to use aluminium and carbon-fibre in place of stamped and welded steel. The i3 feels like a more compact vehicle, being about 27cm shorter and 2.5cm narrower than the e-Golf, though it is about 13cm taller. 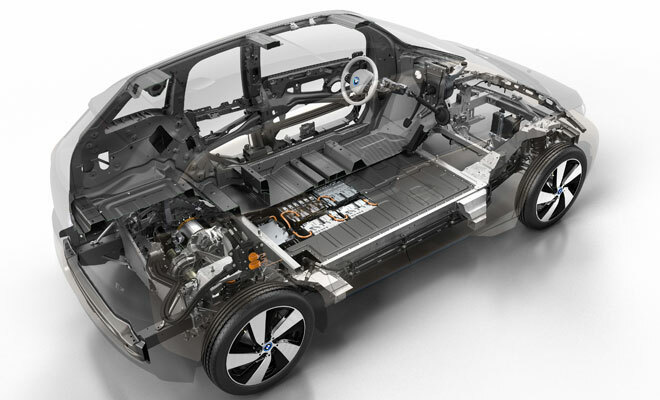 The BMW also uses a smaller 19kWh lithium-ion battery, compared to the VW’s 24kWh reserves. Both cars have an official range of 190km (118 miles), though in practice both will offer variable range according to speed, driving style and the weather. 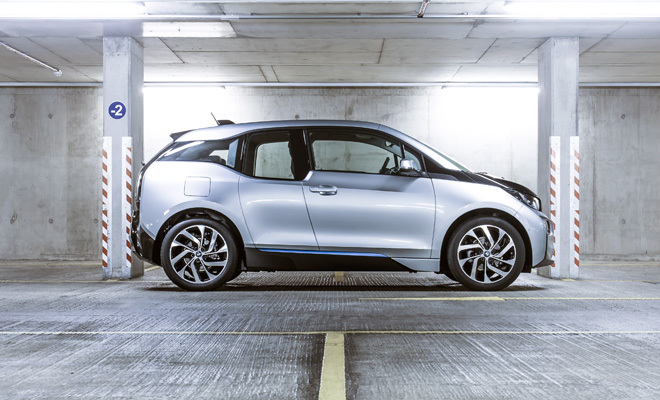 BMW’s i3 feels the most athletic of the two cars, benefiting from both lighter weight and more power. The i3’s electric motor produces up to 125kW (168bhp) and a maximum of 250Nm of torque, compared to the e-Golf’s 85kW (114bhp) and 270Nm of torque. As a result, the e-Golf needs 10.4 seconds to reach 62mph, compared to just 7.2 seconds for the BMW. Top speed is capped at 93mph in the i3 and 87mph in the e-Golf, though the difference is largely academic as sustained high speed will clobber remaining range in either car. Both cars feel lively enough on the motorway, for as long as the battery charge lasts. Both cars handle well, helped by the low-down position of their hefty batteries at axle height. They also share light steering and a relatively stiff ride, meaning either car can get uncomfortable over rutted urban roads. On paper, the i3 should win in agility with its rear-drive layout, while the e-Golf is resolutely front-wheel drive, though the difference is hard to detect on the road. Perhaps because the e-Golf shares clever electronic traction systems and multi-link rear suspension with sporty Golf models such as the GTI. VW and BMW alike offer a selection of three driving modes designed to trade efficiency against urgency, though the BMW’s full economy mode is more tolerable than the e-Golf’s more heavy-handed maximum miser mode. The e-Golf, by contrast, defaults to a gliding mode where it sails ahead on its own momentum whenever the throttle lifts. Prodding at the gearstick allows the driver to decide among four levels of energy recuperation, up to a maximum level that feels just as strong as the BMW’s. The base price of the e-Golf is £25,845 after a £5,000 contribution from the government’s Plug-in Car Grant. The i3 starts from £25,680 after the grant. Both cars come reasonably well equipped as you’d hope given their starting prices. The VW is available only in one trim grade, based on the mid-range Match specification, whereas the i3 can be upgraded to Loft trim for £1,000, to Lodge spec for £1,500 or Suite spec for £2,000. Loft brings a mix of fabric and faux-leather upholstery, wheel-mounted buttons, plus other interior changes. Lodge adds pale wood and leather to the dashboard, plus wool and leather upholstery, while Suite provides full leather for the seating. A full leather upgrade for the e-Golf costs £2,095, while buyers would also be well advised to spend £825 upgrading the standard cabin heater to a heat-pump design, which is much more efficient and will extend winter driving range by up to 20%. 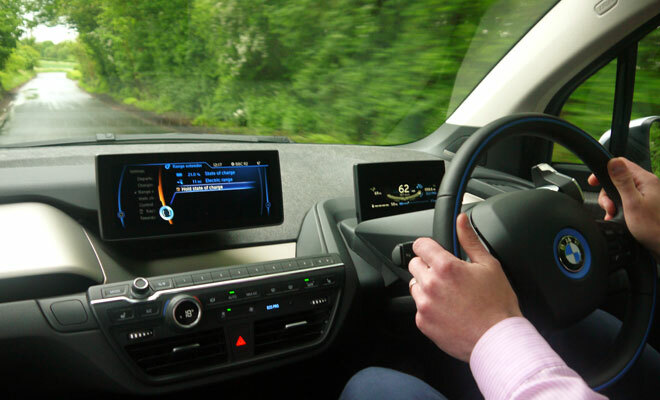 A heat-pump is also optional with the i3, costing £530. 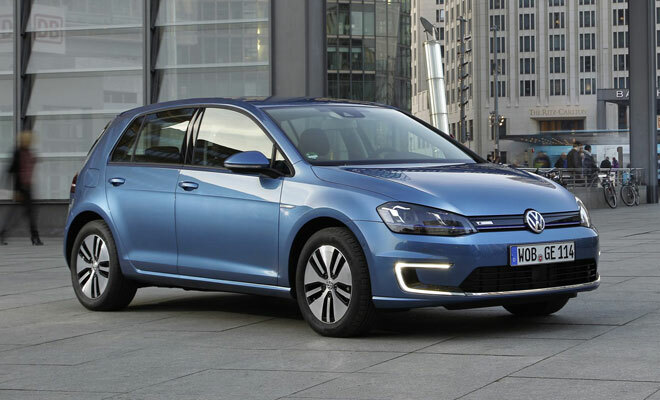 The e-Golf falls into insurance group 15, the same as the BlueMotion Golf or about average for this size of car. Insurance for the BMW will likely cost substantially more as it has been placed in group 21, presumably as a consequence of its unusual body structure. Both cars come with an eight-year, 100,000-mile warranty for their battery, plus three years of cover for the rest of the car – good for up to 60,000 miles for the VW and unlimited miles for the BMW. Crash testing yielded a surprising four rather than five stars for the BMW i3 when assessed by Euro NCAP in 2013, with disappointingly low marks for whiplash, pedestrian impact and active safety. 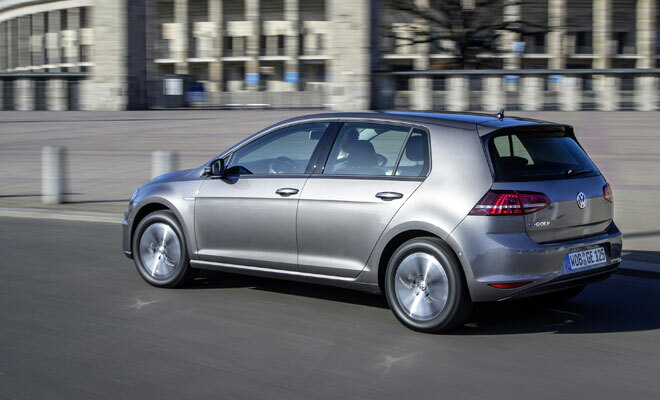 The current Golf, tested in petrol guise a year earlier, received a full deck of five stars, though the e-Golf itself has not been tested and is 380kg (just over 30%) heavier than the model tested. Despite very different approaches to their respective electric cars, there’s actually little to choose between BMW’s i3 and Volkswagen’s e-Golf. In our opinion, the BMW offers superior basic appeal and a much better claim on sustainability, while the e-Golf feels a more practical car that should be cheaper to insure. Both are impressive from behind the wheel, offer roughly the same range between charges and come with enviable badge kudos. 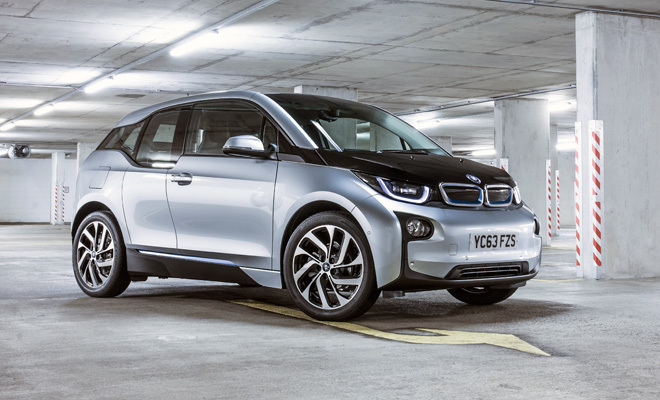 Our narrow winner, though, is the BMW i3. It feels like a product freshly beamed down from the future, whereas the e-Golf seems like an ingenious update to the ironwork of the past. We have no hesitation about which of those two approaches we’d most like to own.